If one writes poetry in bound verse, the poet must follow the rules or the form loses its character. “Blank verse” is written in un-rhymed iambic pentameter. It can be written in another form, or no form at all, but it will no longer be blank verse. The thing is its form. Similarly, the martini is (or should be) akin to the bound verse of cocktails. The true list of potential alcohols — gin, vermouth — is austere. There are two popular garnishes — the twist and the olive — and one nearly forgotten: the cocktail onion. The combination of gin, vermouth and a cocktail onion (or two or three) takes the martini into a different landscape, one that is savory, biting, autumnal. There is something sturdy about it, something cool and coded. Although the French 75 makes a superb cocktail for Thanksgiving or Christmas, the Gibson seems to have its feet sturdily planted in the Thanksgiving season. Creating a Gibson is, in some ways, akin to developing the narrative in a white-collar criminal case. There are few elements; most of the facts are undisputed; what matters is corrupt intent, or its lack: According to Imbibe, the origin of the Gibson is disputed: In the early 20th century, graphic artist Charles Dana Gibson is said to have requested a fresh take on the Martini while visiting New York private social club The Players, resulting in the garnish swap. There’s also an allegedly teetotaling Mr. Gibson who dropped an onion into his water-filled Martini glass to differentiate his drink while maintaining appearances among colleagues. Most perplexing of all, the earliest renditions of the Gibson, such as in William Boothby’s 1908 The World’s Drinks and How to Mix Them, make no mention of an onion. Robitschek’s favorite story remains that of San Francisco businessman Walter Gibson, who supposedly slipped an onion into his drink, believing it prevented colds. “I love any story that showcases the health benefits of drinks, although this one may not be true,” he says. Playwright Eugene O’Neill supposedly drank his Gibsons at the Garden Hotel in New York (but added soda — most likely, to mask low-quality gin). Novelist Kingsley Amis was a fan: When the novelist, literary critic and spirits connoisseur Kingsley Amis proclaimed, in his exemplary booze treatise, Every Day Drinking, that “the Dry Martini is the most famous and the best cocktail in the world,” he was thinking not of the commonplace tipple one endures at the pub or the hotel bar – that briney lukewarm afterthought sadly barnacled with its single olive – but of a particular class of this illustrious libation. 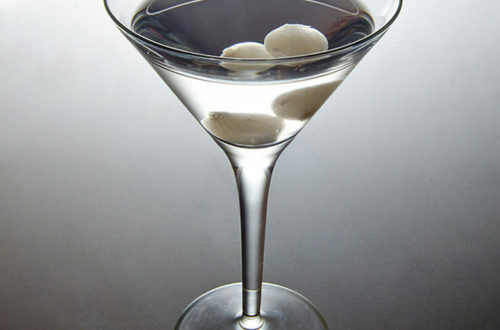 “The best Dry Martini known to man,” Amis wrote, “is the one I make myself for myself. In the cold part of the refrigerator, I have a bottle of gin and a small wineglass half full of water that has been allowed to freeze. When the hour strikes I half fill the remaining space with gin, flick in a few drops of vermouth and add a couple of cocktail onions, the small, white, hard kind. Now that is a drink.” Read the whole article: In praise of the Gibson martini, the world’s finest drink The Gibson is listed as an official Mad Men cocktail. Cary Grant orders one in North By Northwest (1959) as he seduces Eva Marie Saint: If you want to try your hand at making your own pickled cocktail onions, here is a recipe from Rosie Schaap at the New York Times.